Support for thyroid dysfunction. This homeopathic medication reduces the tightness and pressure in the thyroid gland, helps regulate heart function damaged by a toxic thyroid condition and combats hardening and thickening of the thyroid gland. 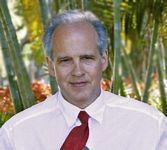 In addition it hinders increased goiter size, addresses nervous weakness, tremors and a general emotional or depressed mood, as well as pressure and tightness in the gland. This preparation also helps suppport cardiac disorders that frequently accompany thyroid dysfunction, including tachycardia, extrasystole, feeling of tightness and shortness of breath during physical activity. Toxic accumulation in matrix of thyroid. ALWAYS CONSULT A PHYSICIAN FOR THYROID DISORDERS!! Apo-Strum is added to any other drainage and regulation remedies in order to target their effects to the thyroid, and using the other drainage remedies to ensure that toxins downloading from the thyroid matrix exit the body. ¼ to ½ tsp taken 2 or 3 times per day. Use in the context of an program focused at regulating the thyroid and detoxifying the matrix of the thyroid. Thyroid programs will include phases where the vitality is being built up, and phases where excretion of toxins is being provoked. Apo-Strum is usually used in the provoking phase of the program. 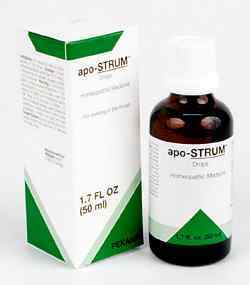 apo-STRUM drops have a tradition of benefit for thyroid dysfunction, including hardening or enlargement of the thyroid gland. It contains Hedera helix that provides iodine to the afflicted gland. This remedy also provides benefit for tachycardia, Graves' disease, toxic adenoma, parenchymous nodular goiter, hyperthyreosis and cardiac conductivity disorder. It is extremely important to diagnose and treat thyroid problems - PLEASE ALWAYS CONSULT A PHYSICIAN!! because this condition may eventually lead to more serious illnesses. Causes of thyroid problems may include environmental intoxification, foci in the head area, amalgam intoxification or other stress factors. Thyroid gland dysfunction need not always be accompanied by classic tell-tale signs such as goiter or bulging eyes. Due to modern lifestyles, a latent or mixed form of thyroid dysfunction is common, and minor swelling or knots may be barely visible. The most common condition is hyper-function of the thyroid gland that results from disruption of the sensitive cooperation between hormones and cardiac conductivity. Other factors such as psychological stress can also contribute to thyroid problems. Calcium fluoricum 8X reduces the tightness and pressure in the thyroid gland frequently felt by patients with thyroid dysfunction. In addition, it boosts general energy levels and performance abilities. This component also strengthens and improves the tone of the connective tissues, while stimulating sluggish lymphatic function. Conium maculatum 6X combats hardening and thickening of the thyroid gland. It hinders increased goiter size, and also addresses nervous weakness, tremors and a general emotional or depressed mood. Lophophytum leandri 4X is the classic medication for treating conditions that accompany thyroid dysfunction, such as feelings of pressure and tightness in the gland. It also improves heart, liver and venous circulatory disturbances. A systemic detoxification by this herb plays a key role in returning the thyroid gland back to normal, healthy condition. Hedera helix 3X provides the body with vegetable iodine and enables the creation of two important thyroid hormones, L-Triodothyronin (T3) and thyroxine (T4). Hedera helix also supports intestinal metabolism and regulates heart function damaged by a toxic thyroid condition. Magnesium carbonicum 8X plays a vital regulation role by activating enzymes and immune system function, supporting cardiac activity and acting as a catalyst in metabolism of carbohydrates, proteins and fats. Importantly, it also helps reduce psychic restlessness, as well as pains and infections in all parts of the body. Cytisus scoparius 6X helps treat cardiac disorders that frequently accompany thyroid dysfunction, including tachycardia, extrasystole, a feeling of tightness and shortness of breath during physical activity. Crataegus oxyacantha 1X addresses heart and circulatory system problems that frequently accompany thyroid gland dysfunction. These conditions include coronary insufficiency, cerebral vessel insufficiency, high blood pressure, focal myocarditis and heart muscle damage. Galium aparine 1X is the classic preparation for benefiting glandular swellings, as well as toxic growths of all kinds, including cancerous tumors. In addition, it stimulates liver function, promotes excretion via the kidneys and is highly effective in cleaning the blood of endogenic and exogenic toxins. INDICATIONS: For hypothyroidism; hyperthyroidism; enlarged and dysfunctional thyroid gland. ADEL 6 (apo-STRUM) drops can be beneficial for thyroid dysfunction, including hardening or enlargement of the thyroid gland. This remedy also can benefit tachycardia, Graves' disease, toxic adenoma, parenchymous nodular goiter, hyperthyreosis and cardiac conductivity disorder. It is extremely important to diagnose and treat thyroid problems because this condition may eventually lead to more serious illnesses. PLEASE CONSULT YOUR PRIMARY CARE PHYSICIAN! Some causes of thyroid problems may include environmental intoxification, foci in the head area, amalgam intoxification or other stress factors. Thyroid gland dysfunction need not always be accompanied by classic tell-tale signs such as goiter or bulging eyes. Due to modern lifestyles, a latent or mixed form of thyroid dysfunction is common and minor swelling or knots may be barely visible. The most common condition is hyperfunction of the thyroid gland that results from disruption of the sensitive cooperation between hormones and cardiac conductivity. Other factors such as psychological stress can also contribute to thyroid problems.